The Enfys Program serves 80 children between the ages of 3 and 21. 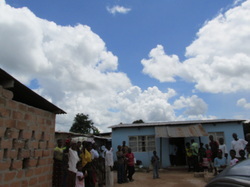 It is run by Pastor Joseph Bwalya and his wife Hildah. Over the past several years the program has changed significantly. We are increasing the areas that Enfys is involved in to help not only their ministy become self sustaining, but also help the households of the children thrive spiritually and become self supportive. Every child on the roster, 80 in all, receives one meal daily. Meals consist of the cultural standard of enshima and relish as well as rotating additions. These include a "healthy porridge" which is made from additional grains, chicken, fish, and seasonal vegetable and fruits.